When you call my name it's like a little... umm scratch that. Anyone who's calling our name with this kind of face means trouble. Have you been keeping up with this sinister sister? She's been freaking us out since we first saw her in The Conjuring 2. We knew she'd be in our top five fears as soon as she trapped Lorraine in that office. But seriously, now that she's getting her own movie, it's about time we let her know we're on her side. There's no way we'd want to encourage her to bring down her unholy wrath on our heads! 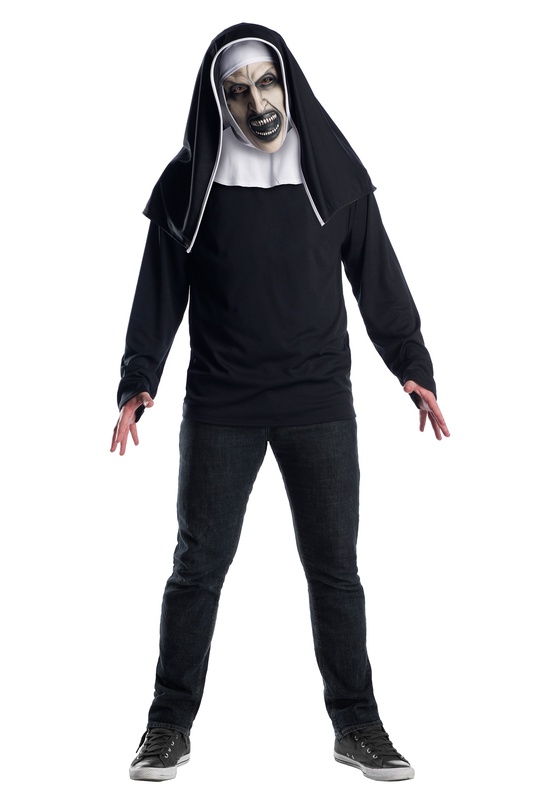 You'll look just like you stepped out of the movie screen when you throw on this haunting mask. Her teeth are bared and as always her skin is gray and wrinkled. The whole thing is topped with a wimple to remind folks of your calling. You can avoid sinning, fast, and bathe in holy water but this nun still gets what she wants. What does she want? We don't actually know, we still haven't seen her namesake movie. We just think you'd better hedge your bets and dress like this matriarchal monster this Halloween!